I'll find your leaks, show you how to fix them, and save you money at the same time! The DB analysis can be done in one of two ways. Either I can go through your DB with you (using Mikogo and Skype), or you can send me your DB and I can give you a written review. Our goal is to find statistical leaks in your DB, which are usually very easy for a trained eye to see. In the past, I have been able to find entire bankrolls worth of leaks in a player’s database, and pride myself on being able to pinpoint problem areas. Remember, any leak that gets closed (even something like a -.20BB/100) can add up in a big way! After the DB analysis we will do a one hour hand history (HH) review. This gives the student a chance to get their hands looked at, and fix up fundamental leaks. Often times detailed leaks, such as bet sizing or action frequency, show up in these HH reviews as well. Overall, the HH review gives students a real chance at getting the most “bang for their buck,” and more leaks patched up versus a sweat session. And finally, the student may pick any one of my poker training videos (excluding any series/package). These videos range from facing preflop 3bets, to bluffing, to hand reading, and are great resources of information that can be viewed over and over again. “I purchased the leakfinder package last week. …I wish I would have done this six months ago. It was a real eye-opener for me when we started running the filters he had setup. 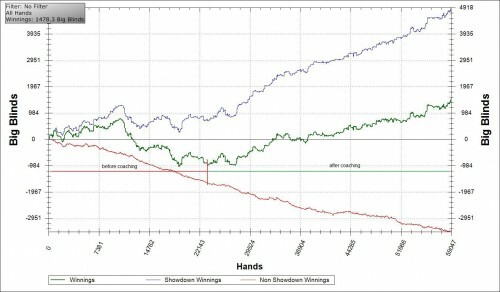 I had a 75k hand sample from $50nl and he found over $1,000 in leaks(that’s over 1.3 ptbb/100!) It was a lot of little things but he identified them quickly and explained why they were wrong and what I needed to change and his explanations made sense. It was also easy to see that these were leaks considering the big ugly red numbers with -$ sitting in front of them. Split was also very professional. He was ready a few minutes early and we launched right into it. We covered a lot of stuff over the hour but it never felt rushed. He’s a good teacher and he knows his ****. I can’t wait for the sweat session portion of the package and I am definitely interested in receiving more coaching after my leakfinder package is complete. For anyone who is considering coaching I would definitely recommend Split.. very professional as well as knowledgeable. He’s got a great knack for finding leaks in poker player’s game. “I recently received a coaching session from James and it was by and far the best experience i have had. We started off with some theory talk and HH review then did a quick and sweet sweat. He was able to point out a lot of little leaks I had in my game and concisely explain to me why it was a leak and how to fix it. But what I liked best is his approach to teaching. He didn’t just tell me why it sucked, but asked me questions so that I could think about it deeper myself. It’s not really learning unless you think you thought of it yourself (if that makes any sense). James is very approachable and friendly which are important qualities in a coach for me. I felt comfortable asking questions and his responses were firm and knowledgeable. I recommend James as a coach if you need someone to tune up your game, leakfind, or just plain teach you how to beat poker. If you are looking to get started as soon as possible, just fill out the application and put “LeakFinder Application” in the title. I look forward to working with you!